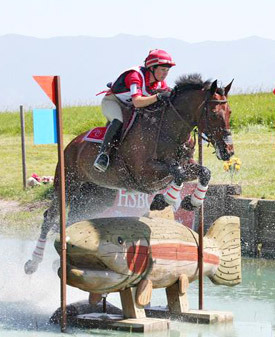 Kelly Prather is on her way to the HSBC FEI World Cup Eventing Final at Strzegom in Poland next month after winning the North American leg at Kalispell, Montana at the weekend. Riding Andrea Pfieffer's mare Ballinakill Glory, Prather, 25, held her nerve in a nail-biting finish to score the only double clear round to hold her overnight cross-country lead in the event at Rebecca Farm. "I just wanted to have a good round," said Prather. 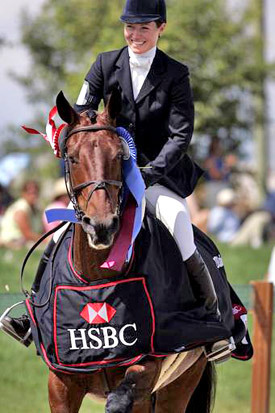 "She is a wonderful show jumper, so it was exciting to ride her and she deserved to jump clear. This was a good course for her and a great flow so you could lock into a rhythm. Coming into the last fence with my reins on the buckle was a bit nerve-racking though!" Second-placed Jennifer Wooten-Dafoe (USA) was equally pleased with her mare The Good Witch, owned by Daisy Tognazzini, clear but with 3 time penalties. "After this performance, I feel I can go to Europe and stand my ground. I'm really excited," she said. The organisers of the event, Rebecca and Jerome Broussard plus Cindy and Larry Lippon have created a fund to help US-based riders travel to Poland. The World Cup final is on August 21-23. Prather led from the start with a dressage score of 45.6, adding 9.6 cross-country time penalties. "She went out of the start box and was stronger galloping than she's ever been. She jumped very big and bold and I never felt a moment's hesitation. It was one of the best cross-country rides ever," said Prather. Wooten-Dafoe, who had the fastest time (5.6 penalties) rose from 3rd to 2nd after cross-country. "I haven't been here (to Rebecca Farm) for a couple of years and the course was great. There were a few changes which I felt were good exercises for the Witch and me. Mark Phillips has designed a superb course and it was beautifully built, which made it that much more exciting to take a spin around it," she said. Dressage runner-up, Tiana Coudray (USA) on Ringwood Magister, incurred 20 penalties when missing the left-hand turn to the B element of the Jurassic Park combination at fence 18 and slipped to eventual 8th. Sara Mittleider (USA) and the veteran El Primero rose from 6th after dressage to 3rd after cross-country but rolled the very last jumping rail to swap places with Californian Kristi Nunnink (USA) on R-Star. Riders were complimentary about the cross-country course designed by Captain Mark Phillips and built by Californian Bert Wood, which featured intricately carved obstacles, many reflecting the Montana culture, and posed all the right questions of riders while allowing horses to fully understand what was being asked of them.